I've been using my iPhone 6 plus for around a week now (upgrading from an iPhone 4). At first I thought how will I manage with this masive screen, I could not imagine having anything smaller now. The camera is amazing, the screen is so clear. I would not swap it for any other phone, big thumbs up from me &#128077;&#128077;&#128077;&#128­077;&#128077;. One negative is it does feel a little vulnerable when in you're Jean pocket particularly when you're sat. Phone cases are hard to come by, however I ordered one from Amazon for £16.99 which is reasonable compared to £44.99 in my local Apple Store. I could not recommend this phone enough. Apple delivers another killer blow to the inferior Android phones. 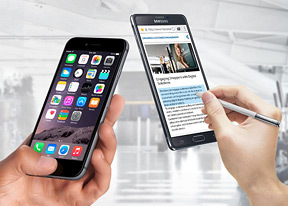 Note 4 is the clear winner in terms of usage and specifications. Apple though has a better brand perception. The iPhone 6 plus is a half baked "pallet." it's just bigger and look really awkward with big top and bottom benzel. The smaller iphone 6 is more worth buying. If you want big phone then Note 4 all the way. However, the iPhone crush Android phones in the apps. Iphone has more good apps. The result is final: the Galaxy Note 4 is the clear winner. It IS the king of phablets and no matter who comes, they will never be able to defeat Samsung in the flagship phablet category. AnonD-245431, 05 Jan 2015It's funny, and hopefully this lands in the right spot, as a comment 'back' to the gentleman a... moreYou need to try the Gear VR so you may understand the true use of the Quad HD Super Amoled display. It would be such an experience that you will forget about all that you think matter on the iPhone. Besides, there are things that the Note 4 can do that's just irreplaceable. Things like the new pop up multitasking and hover over a video's timeline to preview the exact scene you want to watch or hover to preview folders contents and other S-pen specialties. AnonD-345545, 27 Dec 2014This most fabulous iPhone has made me switch over from Android to Apple. Even the most powerf... moreObviously a troll comment, so please people stop responding as if he were even 1% serious and not joking. I've been an android user since HTC Evo came out.but I tell u this the iPhone 6 is still 3 years behind. And I wanted to upgrade to the the iPhone. But I'm not going back in time.it's still the same platform the same thing year after year. Apple says it's here for the people.but there not listening.what the people want.or they just don't care what the people want. Apple never make phones but it just make bark or cover. Other valuable parts are bought from Toshiba , Samsung , lg, sony , qualcom , Tscc etc and assemble them in Beijing. How apple can innovate ? Its innovation is just software modifications. That's why apple use like middle end android phones parts such as screens, cpu , camera etc. New iphone has outer camera lens bump to illute people thin body but it seems like small island in flat smooth ocean. Anonymous, 30 Dec 2014There will become a day that an android release of lollipop will come and have such a smoothn... moreAndroid = Laggy mobile OS. Android 5.0 (Lollipop) has a memory leak bug and fix is on the way.. Still it is not so smoothness and not satisfactory one. It's funny, and hopefully this lands in the right spot, as a comment 'back' to the gentleman about the iPhone dropping to the N4 in battery run down testing, as well as several others. The numbers in several tests and benchmarks are contrary to what other 'reviewers' have found. From class acts; Anand, DisplayMate and ARS... To running the benchmarks I was able to last evening on each device. The results on GB3 show a lower than average multi core score, no single core which typically is how a phone utilizes cores. And the iPhone 6 & 6+ damn near double the N4 in single core performance. The other is exactly what I'm responding to, the comment about the Note's 'better' battery/efficiency tests. B) I don't need benchmarks when I own and have for 90 days a pair of each ...the 6+.s and Note 4s. They're both phenomenal but in ALL cases, heavy gaming or video encoding, manipulation to regular email, Facebook and surfing---we are both blown away by how appreciable the battery life is on both....especially the iPhone. The 6+ is outstanding in its CPU performance metrics. From Google Octane to WebXPRT, SunSpider to Kraken, Basemark overall and B/M OSII 'System' & 'memory', falling ONLY short on BM/OS2'/ Memory & overall graphics (caveat next line 'real world GPU perfomance). On the GPU, Imagine Tech's solution on the A8 wins in 3D MK 1.2 unlimited graphics battle by about the same percentage the Adreno"s 420 beats the IT by in 3DMk2 physics. That said, in "real world usage' IE, instensive 3D 'console type' gaming shows a significantly different story when it comes to (a significantly more reliable and better benching system vs. CPU driven software) FPS both on and off screen. GFXBench 3.0 Manhattan, same story. The A8 sits alone atop the heap in and off screen. On screen the iPhone trounces the '4' with the '6' able to hit 26fps, while the 6+ Almost hits 19. The Note 3-->4 went from 10.8 to 11fps. Obviously (the increase in) resolution helps drain the GPU's power and assets quicker than the lower rez 1080p iPhone dispaly. GFXBench 3.0 TRex HD onscreen 6+ = 41fps, the six itself. Almost 50 and the Note 4 is just over ½ that onscreen performance at about 27fps. Offscreen while the 6+ still leads, it's a closer 40fps on the Note, 45 on the 6. While i love my Note and it's expansion capabilities, it's abilities are shrinking with each iteration and Android update. Unfortunately what I was able to store on my SD card on the Note 1 has been cut significantly on 4.4. And with a single, 32GB model...usable maybe 20GB before you're considering what to get rid of....the iPhone offers 16, 64 and 128 of incredibly quick NAND, especially the larger read and writes. (256Kb). Where as the Note 4 excels with smaller, more random (4k) R/Ws. Both are fast as hell though ...the 6+ achieving near parity with first generation SSD speeds with this batch of iPhones. Again, some more information on these 'tests' that again, just don't add up!